Iowa. Singapore. Main Street. And your backyard. This November, we’ll be exploring the spread of water conservation solutions that begin in your backyard, head downtown, and travel overseas. Green and Main broke ground on its pilot project in Des Moines, Iowa in September of last year. The Iowa-based initiative is focused on the social and environmental transformation of existing buildings and neighborhoods into sustainable communities. For the pilot project, the historic Sherman Hill neighborhood in Des Moines will see the renovation of a mixed-use commercial building originally constructed in 1931. Designer/developer Chaden Halfhill speaks of making an impact on the ‘Main Street level.’ He sees the rehabilitation of existing buildings to exceed current environmental and energy standard as a way to foster community and revitalize Main Street. An 8-HOG Rainwater Harvesting System provides an on-site reserve of water for the Green & Main Pilot Project. Workers install a bioswale in the foreground. “Storm water management and water conservation are two critical areas that we have emphasized for this project,” explains Halfhill. An eight HOG system will assist in the transformation of 800 19th Street by providing a reserve of harvested rainwater on site. “We were able to adjust the location of their placement due to a shift in design strategy,” says Halfhill, highlighting the versatility of the tanks. Eight tanks, vertically installed, will capture water from the carport and the smaller roofs over the entries. The rainwater will be used to establish native plants, and to clean the parking lot and patio area. A green roof helps to manage stormwater, and to direct excess water through a bioswale to a garden. With this renovation, Green and Main is leading the way in Iowa as the first Pilot Project for the Sustainable Sites Initiative. For its LEED certification, Green & Main is assessed on its water and energy use, construction and materials waste, materials used, indoor building quality and the site itself. Strategies include increasing the building’s energy efficiency by 75%, and using photovoltaic panels to generate up to 25% of the building’s electricity. Additionally, recycled and repurposed materials are used for construction. For an in-depth view of the construction practices and green technologies Green & Main is using in its bid to achieve the highest environmental rating (LEED Platinum), click here. The former corner grocery will host Healing Passages, a midwifery owned and operated holistic health and birth center. The second story will provide residential living space. The building will also be a site for ongoing education about green historic rehabilitation. To find out more information, visit greenandmain.org. HOG international distributors are making a strong showing with conference appearances and new installations. And, one enterprising new distributor is opening up new markets for our rainwater harvesting tanks in Southeast Asia. 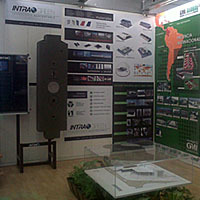 Rainwater HOG Mexico put on a stylish display at the October 18-22 Expo CIHAC 2011 in Mexico City. The conference offered the best exposure in the construction industry and aimed to promote industry best practices. Singapore-based distributor Green Building Materials secured its first Rainwater HOG tank client. Eight tanks will be installed in 6 Terrace Houses on Inggu Road in Singapore. Four of the homes will have one tank each installed for watering the backyard garden. The two corner houses will have two HOGs each; one for the backyard garden, and one in the front for miscellaneous irrigation needs as well as keeping a car sparkling clean with freshly harvested rainwater. Every Little Drop is a company with a goal. That goal is to develop practical water-saving products for household use, from their soon-to-debut shower meter and multi-irrigation program meter, to the now available hose meter. Their ethos is water conservation, their method is simple: offer devices that meter water usage to promote awareness of how much is used in the home. The Every Little Drop Hose Meter starts with the garden. Why is it beautiful? This new water-saving device, with robust plastic parts and intuitive technology, attaches directly to the hose to help monitor water usage. The hose meter displays the current volume of water used, the total volume used (up to 99,000 gallons or liters), and daily water consumption. This user-friendly, durable and water-wise tool sounds mighty fine to us. Why is it useful? The hose meter takes the guesswork out of watering the lawn. No more keeping the hose on for 20 minutes and hoping the plants get enough water. By tracking water usage by volume, the battery-operated device shows when the lawn or garden has reached saturation point. Why is it green? Every drop counts. Research shows that when people see how much water they are using, they use less. Tools like the hose meter combine accessible technology and common sense to promote water conservation in the garden and at the household level. To find out more about the Every Little Drop Hose Meter, click here. 2.4 million gallons. That’s how much water Jamie Rogers of Rogers Remodel Inc. calculates he has helped save in the Bay Area this year. Jamie, a California-based green plumber and Rainwater HOG distributor, was awarded the 2011 Green Plumber of the Year Award for the Western Region. Jamie Rogers, on right, receives the 2011 Green Plumber of the Year Award. Green Plumbers USA awards the prize based on community involvement, innovative projects and effective branding. Winners were announced at the October 2011 WaterSmart Innovations Conference in Las Vegas. Jamie has worked with Rainwater HOG and other community partners in two local schools to install water catchment systems for watering gardens and flushing toilets. Watch his install at Hall Middle School in Larkspur, California here. And see him in action at McKinley Elementary School in San Francisco here. He has also promoted water conservation by serving on local job-building boards and green employment councils. Rainwater HOG would like to congratulate Jamie on winning this prestigious award!